Here’s a mix I knocked together for a gig recently that I thought I’d share with your lovely ears. It’s a party mash-up disco mix featuring bona fide dancefloor bombs by the likes of The Reflex, Dr Packer, David Bowie, Prince, Disclosure, Peggy Gou, Raf Rundell, Sister Sledge + lots more! Just a quick note to say I’ve been struck down by a debilitating lurgy the last few days so unfortunately I won’t be able to do my show tonight. 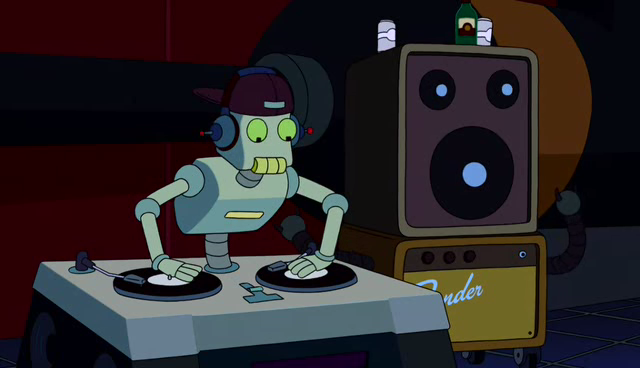 It’s a massive shame because I had some ace tunes lined up for it, but at the moment my body feels like That ’80s Guy in Futurama after his boneitis kicked in, so it’s not gonna happen. Many apologies. Once I make a full recovery, I’ll be back on the air in full safety-dancing health, with a special end-of-year show for you in a couple of weeks. ‘Til then, keep it schwifty. Unfortunately, due to various technical gremlins at Hubie Sounds Studios, I’m unable to broadcast my show tonight. Many apologies. I’ll do my best to eliminate said gremlins (preferably by death-by-microwave) and if I have time I’ll knock together a show in podcast form and upload sometime in the near future. If not, I’ll be back online in a fortnight as per usual. Sorry again peeps. As I mentioned in my last show, I’m taking a short break from NSB Radio in order to pop back to kiwiland to allow my girlfriend to make an honest fella out of me. I should be back on air in late February/early March. I’m sure there will be some quality cover shows airing in my absence, if not the mighty Archive Robot will spring into action to satisfy your aural needs. Don’t forget you can always get your Hubie Sounds fix by checking out all of my previous 122 shows in the NSB Radio archives. You can stream most of them on my Mixcloud too. Also keep an eye on my twitter feed for all of my exciting updates. Due to reasons that are so mind-numbingly dull I won’t mention for fear of boring you into icey oblivion, I’m unable to broadcast my show on NSB Radio tonight. Please accept my apologies. But as ever I’m sure there will be some excellent musics for you to to listen to in my absence. Don’t forget you can always get your Hubie Sounds fix by catching up with my previous shows on my Mixcloud, plus you can download them all from the NSB Radio archives. I’m really looking forward to dropping some funky beats at the Rockit Science Sunday Social this weekend. Headlining the party is the excellent DJ Andy Smith (ex-Portishead) and he is joined by the ever-reliable Rockit Science regulars who will be spinning their usual fine selection of funk, hip hop and disco beats for your lovely ears. For more details, check out the event page on Facebook and give Rockit Science a follow on Twitter. No Show Tonight… Boo! Hiss! I’m sorry to say that I won’t be able to broadcast my show once again tonight. Instead I’m going to be toddling up to North London to watch the fellas pictured above kick a ball around in a fashion that is widely regarded by football experts as being “rather bloody good”. As usual I expect there will be some excellent musics played on NSB Radio in my absence, either via some cover action, or via the Leo Messi of music selectors, aka The NSB Radio Archive Robot. Either way, tune in anyway and get your groove on as usual, cos it’s bound to be good. And if you get a spare moment, if you could offer a small prayer to the Pantheon of Football Gods (led by Dennis Bergkamp, of course) for the Arsenal‘s chances tonight that would be much appreciated. Thank you. Full Hubie Sounds service should resume in March. Thanks for your patience everyone.